Have you ever worked with or for someone who was an entrepreneur? Someone who seemingly called the non-existent into existence? Someone who could see the potential in others or in new possibilities when the future they envisioned seemed impossible? If you are an entrepreneur, I think you’ll find some things in this article that will ring true with you and perhaps even bring a smile to your face. If you are less entrepreneurial but are still interested in picking up a nugget or two from a true story of vision, inviting others into the journey, overcoming adversity, and keeping the mission in perspective, stay with me. My dad’s story just might inspire you. When a leader’s “vision” looks more like a land yacht. One day, my dad rumbled up to our house in the early 1970s in the form of a 1960 Chrysler Imperial that sounded bad and looked even worse. I was embarrassed by the sight of this metal monstrosity but my dad was beside himself with enthusiasm. “We’re going to turn this baby into a motorhome!” he declared. Granted, I was just about 10 years old at the time, but I wasn’t seeing the same possibilities my dad did in his newest mission. The thing was ugly, ran rough, and was embarrassing to have in the vicinity. Have you had a similar reaction when your partner, boss, or CEO boldly declares their latest vision and you wonder what they might be smoking? Even so, I think it is truly a gift to “call the non-existent into existence” like so many successful entrepreneurs are able to do. I realize I’m not a true-blue entrepreneur. I have some entrepreneurial affinity but I’m more of a turnaround guy or an impact catalyst. Even though I’m not quite wired like my dad who was an educator-by-day and entrepreneur-by-night-and-weekend, it can be exciting to be around hard-core entrepreneurs. I especially like being with those are able to effectively recruit others into helping make their vision a collective reality. Recruit others along for the joy ride. Don’t misunderstand me here. Recruiting others to join you on your journey of “calling the non-existent into existence” isn’t simple hypnosis or coercion. Sure, there are plenty of those who subscribe to this theory. After all, it can yield some impressive short-term results. However, if you want to see people run through walls and do more than they had ever dreamed over a sustained period of time, you have to help them find meaning and purpose in joining you. Provide a healthy dose of fun as part of the adventure and you’re all in for a fun ride. My dad was able to do that really well. He was really funny. He genuinely enjoyed being around people and seeing them accomplish great things. For him, the mission went beyond the mere accomplishment of doing stuff that others said couldn’t be done or simply transforming basket cases into mechanical works of art. He seemed to enjoy the twisted journey as much as the final destination and didn’t want to make the trip all by himself. Like my dad, I don’t think life was meant to be lived in isolation. Sure, we need moments of solace. However, I think the real magic happens when we allow our vision to expand and ferment with the active participation and input from others. If you think about it, very few people accomplish truly great things without a little help from some friends. But you barely have one leg to stand on! All of us face challenges and naysayers. Overcoming adversity is part of life. For some of us, big adversities just create bigger victories. In my dad’s case, he lost all the muscles in his right leg when he was stricken by polio at the age of 17. In spite of limping through the majority of his life physically, he was outrunning most people on many fronts. The metamorphosis of the 1960 Chrysler Imperial which transformed into my dad’s version of the Winnebago (with the Chrysler’s ultra-cool push-button transmission mounted on the dash) was a great example. His disability also made room for a 10 year-old son like me to be his helper. Don’t get me wrong, fetching tools, holding boards, gathering equipment on nights and every weekend wasn’t glamorous or even fun much of the time. However, being able to participate in such a deliberate yet drastic transformation of one vehicle becoming something dramatically different over the period of 18 months or so was thrilling. Being able to learn from and be inspired by my dad at such a tender age was priceless. Only now do I begin to grasp what a gift that was. It’s easy to squash ideas that are outside of the norm or to quickly point out the excuses of why embarking on an uncharted path should be avoided. I think fear of the unknown, risks, etc. drives us to that. However, sometimes all we need is a powerful dream, one good leg, and a willing companion with abilities that complement our own to build something great. Celebrate the accomplishment without having it define us. Sometimes, especially when we worked so hard to accomplish something great with lots of battle scars to prove how difficult the journey was, it is easy to lose perspective on the accomplishment. If we’re not careful, we can make the accomplishment define us. In doing so, it can alienate us. 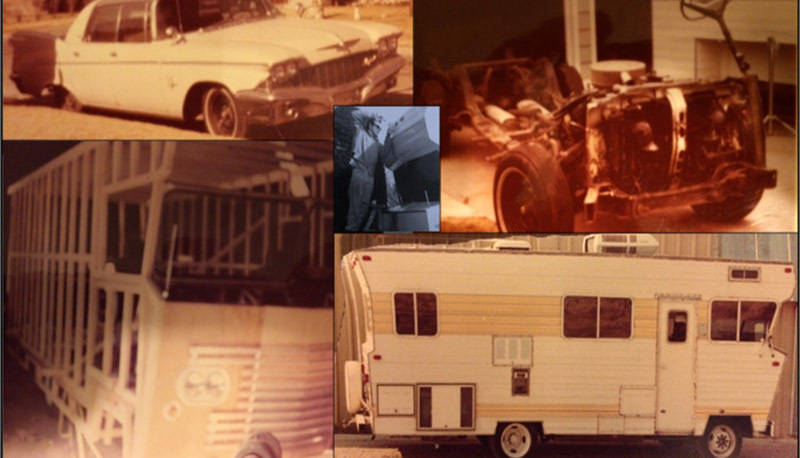 One thing I really appreciate now about the experience that my dad and I enjoyed while building the motorhome is how he didn’t allow such a cool accomplishment like transforming a once-creaky land yacht into a rambling motorhome define him – especially for a guy who was repeatedly told he was a bit nuts for trying such a feat with only having one good leg. We enjoyed using the motorhome after it was built (after the bugs got worked out including a minor engine fire!) and we had some fun times camping in it as a family. I know my dad was proud of it and enjoyed using it but I never got the sense that this accomplishment defined him. That was underscored when he sold it one day to someone who offered cash for it. I remember the buyer whipping out a thick stack of $100 bills and driving it away. My dad didn’t get rich off of it but he felt like he got what he needed to be made whole. We ended up buying another camper (one that wasn’t as cool) shortly thereafter but it didn’t hit me until I was much older how big of a deal it was for the inventor to gracefully watch his invention drive away. Have you seen someone who was so wrapped up in their accomplishment that they allowed it to define them? Have you seen them turn what seemed like a noble mission eventually into a vehicle that ran over anyone or anything that got in their way? Have you ever felt used by a visionary who enlisted your help to accomplish their mission only to feel kicked to the curb once the mission was accomplished? I’ve seen it in the business world many times. I must regretfully admit that I have been guilty of all the above – especially when I was much younger in my quest to build a world-class integrated marketing agency. On one specific occasion, I lambasted an employee with all the finesse of a turbo-charged steamroller as he failed to accomplish MY objective. Our relationship was never the same in spite of my repeated attempts to seek his forgiveness for my insensitivity. Since that time, I’ve made a conscious commitment to never put accomplishments ahead of relationships. Throughout my childhood and my adult life, my dad proved to me in his actions that he always valued me more than his accomplishments. It is great to celebrate accomplishments and to even savor them. However, I believe that there are more important things in life. Relationships trump accomplishments. I hope and pray that no matter how bodacious our newest personal or professional mission may be, we will keep that simple truth in front of us. Dare to dream. Invite others along for the ride. Overcome the detours. Celebrate the milestones. Put relationships in the seat of honor. In doing so, we might just have the kind of positive impact on each other that my dad had on me while we have one amazing journey. Could Your “Sales Star” Be Silently Shipwrecking Your Company?